This passive DI box is ideal for connecting your musical instrument to a mixing desk, converting a high impedance signal to a low impedance signal. 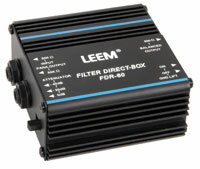 This unit incorporates a filter to reduce RF interference, which can be a problem with other passive DI boxes. It also provides a ground lift switch for hum free performance and an attenuator for compatability with any mixing console.